When I have my dental implant procedure, what type of anesthesia can I expect? Many people fear dental surgery. I’ve had many patients tell me about negative experiences they had with other practitioners. All too often, people wait to get the care they need as a result of these negative experiences. To help alleviate surgical fear and anxiety, I will perform the needed surgical treatment with an anesthesia in pill form. I have extensive training in providing safe and effective anesthesia to enable patients to undergo tooth replacement therapy in a safe and effective manner. My well-trained and attentive staff will monitor you throughout the entire surgical visit. We are dedicated to providing the most advanced techniques in anesthesia so even the most anxious patients are able to undergo implant procedures with comfort and ease. 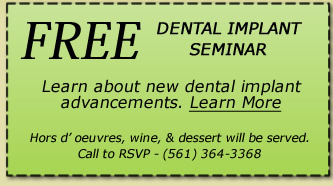 Is there any chance of dental implants leading to gum disease? Implants cannot cause gum disease, but if you do not care for your implants properly, at home and with regular visits to your dentist, plaque will accumulate around your implants and cause inflammation of your gums. If this is not treated, it can lead to bone loss around your implants. If you take good care of your implants, they will serve you well for many, many years to come.